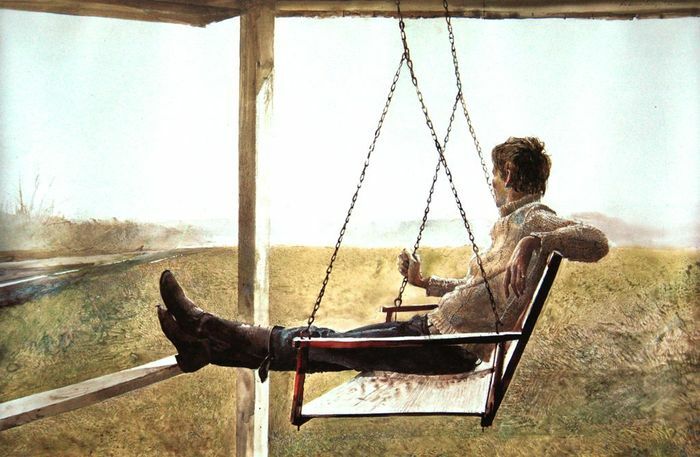 Andrew Wyeth grew up in the early 20th century—educated by his father, an acclaimed illustrator, and inspired by New England’s pastoral beauty. His career as a regionalist painter spanned nearly 75 years, lasting up until his death at the age of 91. In partnership with Wyeth’s hometown museum, Brandywine River, the Seattle Art Museum invites you to explore over 100 of his paintings and drawings this winter at a just-opened retrospective exhibition. Here’s what to look for at the Andrew Wyeth Retrospective at Seattle Art Museum. Egg tempera was both Andrew Wyeth’s and Michelangelo’s medium of choice. Made by mixing powdered pigments, water and egg yolk, these permanent, fast-drying paints perform more like pastels than traditional acrylics or water colors. They’re a little fussy to work with—if you make your own, like Wyeth did, you need to pay constant attention to them, adding more water or yolk to maintain your desired consistency. For convenience, most artists switched to oils and acrylics after they were invented in the 1500s. Wyseth’s command of this tricky medium is truly awe-inspiring. Some of Wyeth’s most celebrated works are of his birthplace, Chadds Ford, Pennsylvania, and his summer home in Cushing, Maine. Depicting forbidding seascapes, brittle, colorless grasses and rolling hills, Wyeth was fascinated by his surroundings. He drew inspiration from childhood strolls with his family, and long afternoons absorbing the writings of some of his naturalist heros—Henry David Thoreau and Robert Frost. One of our favorite works in the exhibit is Winter–Wyeth completed it just after his father, N.C. Wyeth, was struck by a train in 1946. The painting depicts a young boy in an aviator’s cap, hand out, as if for balance, running down the hill just beyond the tracks where N.C. Wyeth was killed. Given the significance of the location, and the boy’s hardened, furrowed brows, the painting evokes the desolation of death, and a free-falling feeling of grief. See Andrew Wyeth in Retrospect at Seattle Art Museum through January 15th. Image via Flickr.